Today's 2015 PokerStars.com EPT Season 12 Malta €25,750 High Roller final started with eight seasoned players hungry for a title. All were ready, however all but one would eventually fail in their objective. 2013 November Niner Sylvain Loosli was the first to go. After losing a big flip with ace-king to Byron Kaverman's queens he was severely short stacked. He busted not much later to Mike "Timex" McDonald after getting it in preflop with queen-eight against king-deuce. A king on the flop sealed the deal for McDonald. Loosli's countryman Benjamin Pollak was next to go and just like that the table was free of French players. Again it was McDonald doing the dirty work, making him the French angstgegner for future tournaments. Pollak pushed from the button with ace-deuce and ran right into McDonald's ace-jack. A jack on the flop was all it took for McDonald to score another knockout. After numerous players doubled — Juha Helppi was especially getting lucky flopping a five with pocket fives all in preflop against kings — finally another player hit the rail. Sam Greenwood, who began the day as the chip leader, was on the bitter end of most equations when it came to showdowns, and he was the next to go. At one point he was leading with just 15,000 shy of 5 million in chips, but an orbit later he was the shortest stack at the table. "What a fun orbit this has been for me!" Greenwood said with a feel for sarcasm after doubling up Jason Wheeler twice. Greenwood eventually fell to Helppi in a spot where he was already short and flopped bottom pair. Helppi had flopped top two and faded the two outs of Greenwood. Kaverman followed Greenwood out the door. 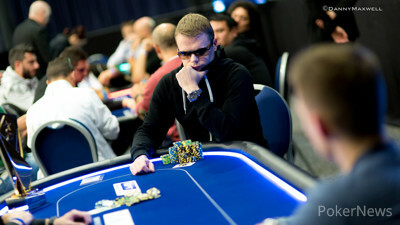 Kaverman had played a solid tournament and was extremely calm and collected at the final table. He had played his fair share of big pots but mostly gathered chips without showdowns. In the end he fell victim to Helppi's rise, calling a big shove with ace-jack. Kaverman must have thought Helppi wouldn't make that move with real big hands, but Helppi showed up with jacks nonetheless. A board full of blanks and Kaverman hit the rail in fifth place. 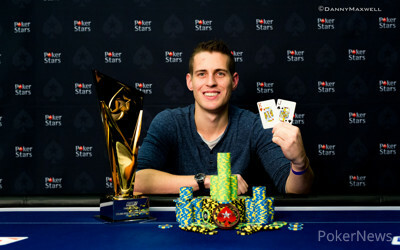 Wheeler, who qualified for the tournament in a satellite late on Day 1, finished in fourth position for €178,580. He too played a solid game but couldn't fade a setup of big hands in the end. He played the short stack game like a true master, but even he couldn't get away from ace-queen short stacked and short handed. Nick Petrangelo had ace-king suited and Wheeler ended up drawing dead on the turn. The three remaining players had the clock paused to discuss a deal. Helppi, Petrangelo and McDonald all seemed interested, but in the end a deal would not be agreed upon. Petrangelo was happy to just chop the remaining money and call it a day without playing any further, while Helppi and McDonald were more interested in setting some money aside. The three decided on keeping €15,000 in the middle to play for, but Helppi wanted all three players to pay €5,000 to get to that prize. McDonald and Petrangelo didn't agree since Helppi had way more chips and a far bigger chance of winning the extra €15,000. In fact, with the €15,000 Helppi would almost have first place guaranteed, but the Fin didn't agree to put in €7,000 instead of €5,000. Just like that the three players decided to play it out without a deal in place. Not long after, Petrangelo after finding ace-jack and running into McDonald's ace-king. The board came no higher than an eight and McDonald and Helppi were heads up. Despite both being regulars on the EPT and both playing lots of high rollers, both Helppi and McDonald were looking for their first EPT High Roller title. Helppi started out in the lead, but during heads-up play it was all McDonald. The momentum, which had been in Helppi's corner the entire day, shifted completely, and not much later it was McDonald holding the trophy for the winner's photo. In the last hand McDonald limped in with king-jack and calmly called Helppi's shove with king-eight suited. By the time the turn was out, Helppi had only four outs for a chop, but he came up short and had to cede the victory to McDonald. Mike McDonald limped in from the small blind and Juha Helppi glanced at his cards. He announced all in and all McDonald did was toss in a single 5,000 chip to call. Helppi knew he was in trouble. The in the window was anything but a good sign for Helppi, though he found some hope of a good outcome with the rest of the flop: . Helppi needed a queen or running eights but failed to get so lucky. The on the turn and on the river were blanks and the title went to McDonald. Helppi had to settle for seconds, netting him €354,440. Mike McDonald continues to hold over Juha Helppi here, winning pot after pot. The latest started with a 400,000-chip open from McDonald, which Helppi called. The flop came down and Helppi led out for 525,000. McDonald called and the turn was the . Both players checked, and did so again on the river. Helppi showed queen-high, but once again, McDonald held the best hand, turning over for trip tens. 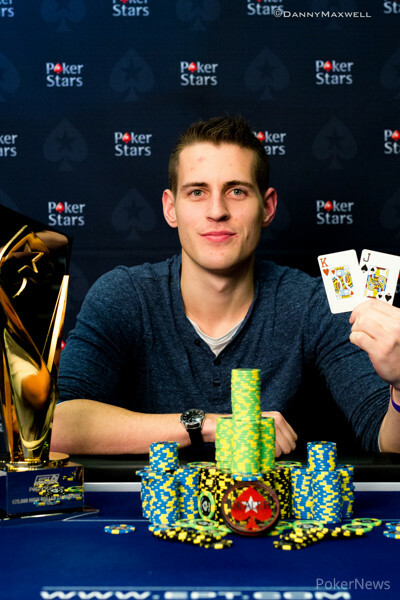 Mike McDonald made it 400,000 from the button and Juha Helppi made the call. Both players checked the flop and turn. Helppi bet 400,000 on the river and McDonald instantly said he wanted to fold his hand. In the end he didn't, only for him to muck upon seeing Helppi's full house with . The next hand saw Helppi raise to 400,000 and McDonald call. Both players checked on . Helppi fired 525,000 on the turn and 900,000 on the river. McDonald called on the turn but folded on the river. Mike McDonald made it 350,000 to go from the button and Juha Helppi defended. The flop came and Helppi check called a bet of 275,000. Both players checked the on the turn and the completed the board. Helppi bet 500,000 and McDonald made the call with a somewhat reluctant face. Helppi showed for the missed flush draw, McDonald tabled and took it down. Juha Helppi made it 400,000 and Mike McDonald defended. The flop fell and after a McDonald check, Helppi continued for 500,000. McDonald called and the turn came the . McDonald checked and Helppi kept firing, making it 900,000. McDonald called again. On the river, both players checked, and McDonald flashed before Helppi turned over to win it. McDonald made it 350,000 from the button and Helppi three bet to 900,000. McDonald called and called the 1 million c-bet on as well. The turn came the and Helppi check folded to McDonald's 1.5 million bet. The next hand saw Helppi raise to 400,000 from the button. McDonald called and check called the 525,000 bet on . Both players checked the on the turn and the popped up on the river. McDonald lead out for 1.2 million and Helppi tanked for a fair bit. McDonald asked for the clock but Helppi had already folded when the one minute warning was given by the floor.